The word I was searching for is "ephemeral". What a great word it is to so perfectly describe the flowering of many of Spring's trees, shrubs and vines. They arrive, spread their own individual brand of Spring glory, and a week or so later, they have passed the proverbial "baton" on to the next flowering variety. I look forward to them, love their bloom-time and then am always a little sad at their passing. At our Asheville bed and breakfast, the gardens are quite extensive and quite "English". In the mid-1990s, I designed them and built the separate garden spaces, or "Rooms". Creating individually-themed gardens, separated by walls or fencing or high hedges so as to make each "Room" a unique experience, became a more common style of garden-plan in the late-19th century in England. I enjoy many English gardens just for those reasons: "individual" and "unique". 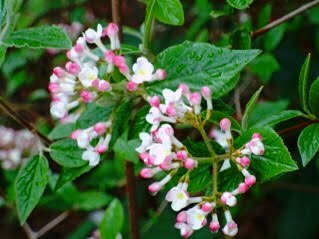 Today we're talking about one Spring flowering tree, one early Spring shrub and one early flowering vine. The reason is: they are all blooming at this very moment. You would absolutely notice the tree and probably notice the shrub, but you might even miss the fact that the vine flowers at all. 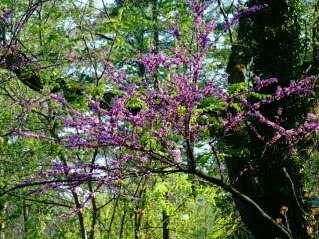 The tree is: "Cercis canadensis", more commonly known as Eastern Redbud. Seems odd to call it "redbud" because the flowers are not really seen as buds and the blooms are definitely not red. What they are is glorious! Before almost any tree in this area has its leaves, you can see these fabulous blossoms, hugging the stems of the tree, in their rose-pink-to-deep-lavender colors. A sure sign that Spring is starting in earnest. The form of the tree itself gives one an "Oriental" sense and they can reach 25-25 feet high in the right situation...although in my back garden, they are more like 20-25 feet. 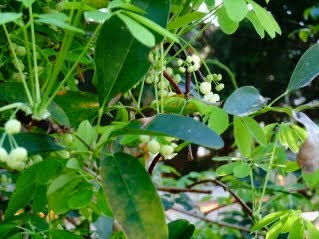 The tree is actually a legume, related to peas...and so it might not surprise you to find that the flowers are edible and the seed pods that appear in the Summer can be stir-fried before they become completely ripe. 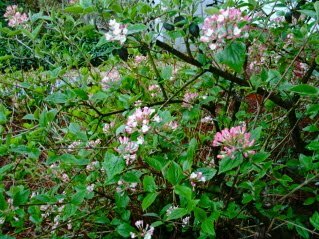 The shrub is : "Viburnum burkwoodii". It is generally an "understorey" plant that can reach15 feet high if left to its own devices, but can be pruned to keep it at 6-8 feet without difficulty. It prefers dappled sun to direct sunshine, but does better with more rather than less sun. At our Asheville bed and breakfast we have 5 of these wonderful shrubs...located next to the front porch and in the "Shade Garden" that is to the south side of the house. At this time of year baseball-size clusters of multiple white blooms with rose-colored throats burst forth from rose-colored buds. They are so lovely nodding in the Spring breeze. 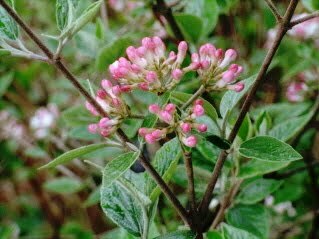 But the 'piece de resistance' for this shrub is the fragrance of those blossoms. On a calm, warm Spring day, the entire front porch smells like vanilla! Marvelous! The vine is : "Akebia quinata". From the name you might guess that this vine produces leaf clusters with five leaves each...and you'd be right! And some of this vine's detractors refer to Akebia the same way most of us refer to Kudzu. In the wrong spot, I have been told, this vine will run wild and be very hard to control. At Abbington Green Bed & Breakfast, however, we have several of these...three climbing metal poles that come up and over the back porch area and others along lattice fencing along the perimeter of the gardens at the south side of the house. Akebia grows quickly, but can be trained each season to trail along the poles or fences. And in Winter, we cut it back hard so it will "do its thing" again the next Spring and Summer. The vine does bloom, but you need to look carefully and you need to look NOW. We have two colors of Akebia: one is white and the other is called "chocolate" for the tiny reddish-brown blooms that cluster on the vines now. The flowers have always reminded me of tiny ladies' purses...very sweet, indeed! So as always, Asheville NC and our bed and breakfast offer fun, flowers and the wonders of Springtime. We look forward to seeing you soon!